Ann Arbor, Mich.—The SCC braved sub-freezing weather in Michigan to earn nine top-10 finishes and emerge one spot higher in the conference standings. The results from the weekend elevated the SCC to an all-time high of 6th place in Div. 1 in the MWCCC. Last week the Cards were ranked 7th after a strong showing at the Lindsey Wilson race weekend. The SCC is now four points clear of Indiana University, who dropped from 3rd place to 7th, and is 15 points behind 5th place University of Wisconsin-Madison. Find the full conference results here. On the first day of the race weekend, Michigan State hosted a difficult, dirt-path road race, followed by a 12km Individual Time Trial. The Men’s D race was the first of the day, rolling out with a temperature of 17 degrees. It splintered early when UofL rider Devin Brown crashed out in the first section of hard-pack dirt, separating the field into a large break and large chase. Abner Miralda stayed clear and finished 8th, Brown only suffered minor injuries. In the gently rolling 12km Time Trial, Francisco rode to a 12th place with a time of 17:32, King finished 8th in the B’s at 18:03, and in the D’s, Miralda finished 4th with a time of 18:38. “I tried to keep it steady the whole time,” said King after the event. To see full results of the RR and ITT, click here. 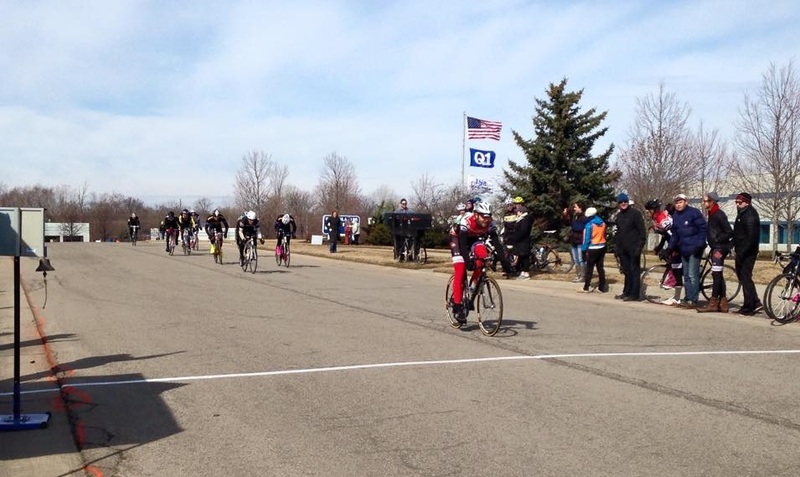 The following day, the University of Michigan hosted the criterium at an industrial park with wide, smooth roads. The temperature for the race was unyielding however, remaining in the teens for most of the day. Miralda finished 4th in the men’s D race, while King finished 8th in the Criterium. Francisco finished 14th in the A race. To see full results of the criterium, click here. The SCC is now preparing for the next collegiate race weekend hosted by Purdue University on April 11th and 12th. 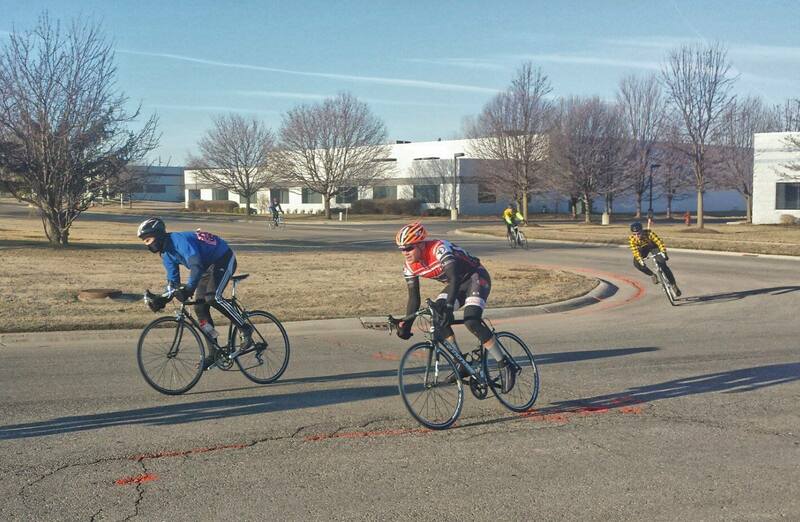 Miralda sprints around the final corner in the splintered D field in the Criterium. Ben King and Jason Eisenmenger ride in the strong Men’s B field at the Criterium. King spent time attacking to earn prime points.